Evans, F. J., Gustafson, L. A., O'Connell, D. N., Orne, M. T., & Shor, R. E. Sleep-induced behavioral response: Relationship to susceptibility to hypnosis and laboratory sleep patterns. Journal of Nervous and Mental Disease, 1969, 148, 467-476. Nineteen Ss slept for 2 nights in the laboratory. Verbal suggestions were administered to the Ss while they were in stage 1 sleep (defined by conservative electroencephalographic criteria). A cue word presented during alpha-free stage 1 sleep was sometimes sufficient to elicit the suggested response without awakening the S, even when a temporal delay existed between the suggestion and the cue word. For example, the cue word could be repeated in the same stage 1 period as the suggestion (immediate), or during a 2nd night without repetition of the suggestion (carry over). With the latter, the S had no waking memory for the procedures of the previous night. Susceptibility to hypnosis was assessed after all Ss had completed the sleep sessions. A complex relationship was found among the frequency of sleep-induced response, susceptibility to hypnosis, and how well the S slept. Insusceptible Ss were less likely to respond while asleep and had less opportunity to respond because they awakened when cue words were presented. They had also reported that they were poor sleepers outside of the laboratory situation. Response to sleep-induced suggestions was not correlated with waking motor suggestion, nor with hypnotic passive and challenge suggestion. Rather, sleep response rate was significantly related to hallucinatory and posthypnotic clusters of hypnotic behavior (which can be experienced only by deeply hypnotized Ss), particularly with responses obtained when there was temporal dissociation between the suggestion and the cue word. Thus, the multiple correlation predicting the carry over response frequency during sleep, using S's subjective sleep patterns and either the hallucinatory or posthypnotic clusters as predictors, was .62 and .68, respectively. The relationship between sleep-induced behavior and hypnosis does not seem to imply any similarity or interchangeability of hypnotic and sleep states. 1 Unit for Experimental Psychiatry, Institute of the Pennsylvania Hospital, 111 North 49th Street, Philadelphia, Pennsylvania 19139; the Department of Psychiatry, University of Pennsylvania. This study was supported in part by Grant AFAFOSR-707-67 from the Air Force Office of Scientific Research, and in part by a grant from the Institute for Experimental Psychiatry. The authors wish to thank our colleagues for their helpful comments during the completion of this study : E. Cogan, J. Dittborn, C. H. Holland, K. Hurson, J. J. Lynch, E. P. Nace, U. Neisser, Emily Orne, D. A. Paskewitz, C. Perry and JoAnne Withington. The technical assistance of Mary J. Bryan and Robert Lazar, as well as B. Blicher, H. Kaiser, W. Orchard and C. Stafford, and the editorial help of Mary Louise Burke are also acknowledged. 3 Now at the Massachusetts Mental Health Center, Boston. 4 Now at University of New Hampshire, Durham. Although a hypnotized S may appear to be asleep, hypnosis and sleep are different physiological conditions. Electroencephalographic (EEG) patterns during hypnosis are similar to those of relaxation but are unlike any of the currently recognized stages of sleep (5, 15, 19, 21, 28). Historically, it has been recognized that if a hypnotized S is left alone or is given a specific suggestion, he may fall asleep without passing through a natural awake state. A more controversial claim has also been made: that hypnotic-like suggestions can be given successfully during sleep (2, 3, 13, 14, 25). Few empirical studies are available which evaluate the relationship, if any, between hypnosis and sleep. Barber (1) whispered "hypnotic"-like suggestions to 22 Ss who were asleep in their rooms. No behavioral signs of awakening were observed with 12 Ss who responded to suggestions that could be elicited also during light hypnosis, but physiological and EEG criteria were not employed to monitor sleep. Using EEG monitoring, Borlone, Dittborn and Palestini (4) reported that sleep could be turned into hypnosis by appropriate suggestion, but they observed that waking alpha activity occurred when the E spoke to the S. Dittborn and O'Connell (8) found that the ease of inducing physiological sleep experimentally was not correlated with susceptibility to hypnosis. Stoyva (27) found that hypnotic dreams did not compensate for stage 1 rapid eye movement (dreaming) sleep deprivation. Soviet and Eastern European studies of sleep learning (hypnopedia) are more difficult to evaluate. These studies, reviewed by Hoskovec (18), seem to indicate that learning during sleep can occur only with Ss who are "suggestible." Unfortunately, it is unclear whether EEG monitoring has been employed in these investigations, and no distinction is made between waking suggestibility and hypnosis (10). A difficult problem encountered in most of these studies involves discriminating between sleep and wakefulness. Sleep has been defined: a) behaviorally by the general appearance of the S and his apparent inability to communicate with his external environment; b) subjectively by the S's post hoc report about whether he was asleep; and c) physiologically by such methods as EEG monitoring. There may be transient shifts in states of awareness, and at such times different indices of the ongoing state may be out of phase. Consequently, these criteria of sleep may not always agree, particularly when a continuous evaluation has to be made while the S may fluctuate momentarily between stages of sleep and arousal. For similar reasons, no single approach, including the physiological, is sufficiently reliable to use exclusively when continuous diagnoses are required (7, 8, 12, 22). In this study, concerned with stage 1 sleep, the presence of visually detected alpha activity has been accepted as a conservative criterion indicating arousal. Behavior during sleep was tested only during those periods when the EEG record did not show alpha-like activity (between 7 and 12 cps). The problem has been elaborated elsewhere (12, 22). ment, at least during stage 1 sleep. Some Ss can remain asleep and still respond behaviorally to verbal suggestions administered previously during stage 1 sleep (6, 11, 12). For example, the suggestion was given during stage 1 sleep: "Whenever I say the word 'blanket' you will feel cold, until you pull the blanket up, covering yourself." The cue word "blanket" was subsequently sufficient, in several instances, to elicit the response, even though the EEG showed no sign of arousal. These studies have demonstrated that meaningful behavior can be elicited from sleeping Ss without evoking EEG signs of alerting and that mental activity in addition to dreaming is possible during sleep.5 The sleeping S maintains some ability to interact with his external environment. When the S was awakened, he did not remember the verbally presented material, nor could he remember responding. His lack of recall involved a waking amnesia rather than an irreversible forgetting: the material was still available for future "recall" during sleep. When the S returned to sleep the next night, or even 5 months later, the mere repetition of the relevant cue word, without repetition of the suggestion itself, was sufficient to elicit the appropriate response. In spite of the intervening waking amnesia, the appropriate behavioral response could be elicited again during sleep. In contrast, the response could not be elicited by repeating the cue word in the waking state, even when the S was relaxed and drowsy. A successful response tendency was mobilized slowly. An average response latency of 32 seconds was reported, but it increased as the temporal dissociation between the administration of the suggestion and the cue word increased. Because of the similarities between sleep-induced behavior and hypnotic behavior, a relationship between susceptibility to hypnosis and ability to respond to suggestion during sleep was expected. In an earlier study (6), the four Ss who responded to the suggestions administered during sleep were known to be capable of entering deep hypnosis. No responses were observed with another four Ss who were known to be insusceptible to hypnosis. 5 Studies using different approaches have provided support for this conclusion. Several studies reviewed elsewhere (12, 24) have shown that conditioned or instructional sets established prior to sleep may produce behavioral response and discrimination during sleep. The present model is concerned with behavior induced and elicited entirely during sleep. 6 Only those suggestions and cue words preceded by at least 30 seconds of alpha-free stage 1 sleep will be considered in this report. Thus, any response discussed will have occurred to a cue word which was administered in a clear stage 1 sleep record. Evidence regarding scoring reliability and response rates was presented earlier (12). of the Es' biases on the predicted outcome cannot be overlooked. A new study was designed to investigate the relationship between hypnosis and sleep-induced response. In the present study, Ss with no previous experience with hypnosis participated in the sleep experiment. After all of the Ss had completed the sleep study, they were invited to participate in a hypnosis experiment. Susceptibility to hypnosis was then evaluated by other Es who were "blind" regarding Ss' performance during the sleep experiment. It has been reported that 21.2 per cent of the cue words elicited responses during stage 1 sleep (12). The correlation between the number of cues administered to the S and the number of responses was .70. The number of cues administered correlated -.76 with the frequency with which the S awakened when stimulated. It seems that about half of the individual variation in responsivity was a function of how well the S continued to sleep after cue words were presented. In the original study (6), the Ss who were insusceptible to hypnosis did not respond to sleep-administered suggestions but awakened whenever a cue word was presented. Ability to respond when asleep, tendency to arouse when stimulated and hypnotic susceptibility might be related in a complex fashion. As well as examining the relationship between sleep response and hypnosis, this study explored aspects of each S's personal sleep patterns as possible correlates of individual differences in sleep responsivity. A detailed description of the general procedure has been presented elsewhere (12). Nineteen male student nurses slept for two nights in the laboratory. Standard EEG sleep-monitoring techniques were used. Horizontal eye movement activity, palmar skin potential and gross body movements were recorded but were not used to diagnose sleep stages (22). Descending stage 1 periods following wakefulness were not used. During on-line visual diagnosis of alpha-free stage 1 sleep, suggestions were presented verbally to S. Typical suggestions were: "Whenever I say the word 'itch,' your nose will feel itchy until you scratch it;" "Whenever I say the word 'pillow,' your pillow will feel uncomfortable until you move it." The suggestion was tested by saying the cue word ("itch" or "pillow") once. An attempt was made to test each cue word at least twice during the same stage 1 period in which the suggestion was given, during all subsequent stage 1 periods that night and during stage 1 periods of the 2nd night. At least 120 seconds of alpha-free stage 1 were required between cue word presentations. Suggestions were not repeated after their initial presentation. Two new suggestions were presented each night whenever possible. In some cases this procedure could not be completed because the S awakened following stimulation. The S's behavior was observed by the E, who was in the room. Presence or absence of rapid eye movement (REM) bursts during the stage 1 period and latency of any physical activity following cue word stimulation were scored from the polygraph record. When the S awakened in the morning, memory for the session was tested during an interview and by administering the cue words in the context of a word association test. Any behavioral response to the critical cue word was observed. When the S awakened after night 2, a more detailed inquiry evaluated memory for the sleep events. that suggestions would be given, but was told that sleep cycles were being studied. He was not told that he would be invited back later to participate in a hypnosis experiment. Comparisons were made between night 1 and night 2, and between stage 1 REM and stage 1 non-REM performance. In addition, responses were categorized by the temporal relationship between the administration of the suggestion and the cue word. a) Immediate responses occurred when the suggestion and cue word were presented in the same stage 1 period. b) Delayed responses occurred when the suggestion and cue word were administered during different stage 1 periods of the same night. c) Carry over (or dissociated) responses occurred when the cue word was presented during night 2, but the suggestion had been administered only during night 1; at least 1 day of waking amnesia intervened between the suggestion and its associated cue word. Based on individual response rates (percentage ratio of number of responses divided by the number of cue words administered) for the 2 nights combined, a post hoc dichotomy was made between responsive (N = 9) and unresponsive (N = 10) Ss. 1) How many hours do you usually sleep? 2) How long does it typically take you to fall asleep? 3) Are you a fairly heavy sleeper? 4) Do you move about much while you sleep? 5) Do you wake up during the night? 6) Is it easy for you to wake up in the morning? 7) Does a light disturb your sleep? 7 These clusters were derived by summing scores on SHSS:C items as follows. Hypnotic motor suggestion: items 1 and 2, hand lowering and moving hands apart. Challenge suggestion: items 5 and 8, arm rigidity and arm immobilization. Hallucinatory-reverie: items 6 and 11, dream and negative visual hallucination. Posthypnotic-dissociative: item 12, posthypnotic amnesia, and item 11 from HGSHS:A, posthypnotic suggestion. The waking suggestion score consisted of item 1 on HGSHS :A, head falling. These clusters do not represent the underlying dimensions adequately, particularly the hallucination and dissociative ones (9). The clusters are also moderately correlated. The highest correlation (r = .51) is between the hallucination and posthypnotic clusters. 8 Analyses involving the available diagnostic ratings of hypnosis produced results consistent with those reported below using HGSHS:A and SHSS : C.
8) Do people in the room usually awaken you? 9) Are you easily awakened during the night by external noises ? 10) Do you dream very often? 11) Do you dream every night as far as you are aware? 12) Do you remember your dreams? 13) Do you usually dream about everyday events that have happened to you? 14) Have you ever walked or talked in your sleep? "Yes" or "no" responses were eventually scored for all items except the first two. In addition, the number of times the S awakened during the 2 nights of sleep and the length of time it took him to fall asleep each night (as indicated by the appearance of the k-complex) were measured from the polygraph record. Mean HGSHS: A and SHSS: C scores for responsive and unresponsive Ss are presented in Table 1. 9 Those Ss who respond most frequently to sleep-induced suggestions are more susceptible to hypnosis. Pearson correlations between susceptibility to hypnosis and frequencies of cue administration, response and response rate are presented in Table 2. The correlations are positive and consistent for the several measures, indicating that sleep-induced response and susceptibility to hypnosis are related in some manner. 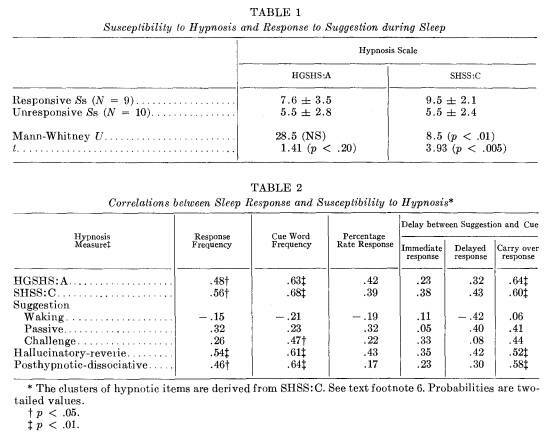 Response frequency: The correlations between susceptibility to hypnosis and response to sleep-induced suggestions are positive and significant (see Table 2). The correlation of the 2-night total response frequency with HGSHS : A was .48 (p < .05) 10 and with SHSS: C was .56 (p < .05). Mediating role of cue word frequency: The correlation between susceptibility to hypnosis and the total number of cues presented during sleep was higher than the correlation between susceptibility to hypnosis and the number of responses obtained during sleep. To what extent do susceptible Ss respond more often because they are administered more cue words? The correlations between response rate percentage and both HGSHS: A and SHSS: C are of borderline significance (.42, p < .10; and .39, p < .10, respectively, two-tailed values).11 Before a conclusion about this question is made, however, further data should be considered. Hypnosis and temporal dissociation of sleep response: Table 2 also summarizes the correlations between hypnotizability and the three categories of response: immediate, delayed and carry over. The correlations with susceptibility to hypnosis are higher for percentage rate of delayed response than for rate of immediate response. Susceptibility to hypnosis more successfully predicts ability to respond to sleep-induced suggestion when there is a temporal dissociation between the administration of the suggestion and cue word, i.e., when the response is elicited during the 2nd night to a suggestion that has been administered only during the 1st night. The correlations for the carry over response rate are .64 (p < .01) with HGSHS: A, and .60 (p < .01) with SHSS : C.
9 The correlation between HGSHS:A and SHSS:C is usually reported to be about .6 (17, 23, 26, 29). There are more high scoring Ss in this sample than the two or three that would be found in most unselected samples of this size. 10 All p values reported are two-tailed unlessstated otherwise. 11 The number of times S awakened during the 2 nights correlated -.49 (p < .05) with HGSHS:A, and -.29 (p > .05) with SHSS:C.
quency of response do not correlate with waking suggestibility, hypnotic motor suggestibility or challenge suggestibility. The correlations with the hallucinatory-reverie and posthypnotic-dissociative clusters are significant only with the percentage rate of carry over (dissociative) responding (r = .52, p < .01; and r = .58, p < .01, respectively), but not with the immediate responding. These two hypnotic clusters include phenomena experienced only by deeply hypnotized Ss. Comparisons are made in Table 3 between responsive and unresponsive Ss on data derived from the presleep interview. Responsive Ss claimed they were better sleepers and were less likely to be awakened during the night than unresponsive Ss. Responsive Ss felt they were less able to recall dreaming. Although they estimated it took less time to fall asleep than the unresponsive Ss, it took them significantly more time to fall asleep in the experimental situation. Responders awakened less often during the 2 nights once they fell asleep. These differences between responsive and unresponsive Ss are similar to differences between "good" and "poor" sleepers reported by Monroe (20). 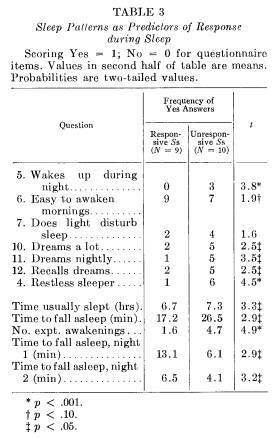 A total score indicating how soundly a S considered he typically slept was derived by summing responses on the questionnaire in accordance with differences summarized in Table 3. The correlation between the questionnaire and response frequency was .55 (p < .02), and between the questionnaire and percentage response rate was .39 (p < .10). The correlation between SHSS: C and response frequency was .56 (p < .01). The questionnaire score correlated with response frequency .55 (p < .02). Combining the predictive criteria, the multiple correlation between response frequency and the combination of the questionnaire and SHSS: C was .68 (p < .001). Substituting percentage response rate, the multiple correlation was .48 (p < .05). The multiple correlations predicting the carry over responses were .69 (p < .01) when the questionnaire and SHSS: C formed the criterion variables, .68 (p < .01) with the questionnaire scores and posthypnotic-dissociative cluster of hypnosis items and .62 (p < .01) with the questionnaire and hallucinatory-reverie items. Subjects who were able to remain asleep while responding to verbal suggestions administered during sleep were more susceptible to hypnosis and slept more soundly than Ss who did not respond. With SHSS: C as a criterion of susceptibility to hypnosis, the multiple correlation between sleep response frequency and the hypnosis and sleep questionnaire scores was .68 (p < .01). This joint relationship reflects the hypnotizable responder's ability to sleep well, in terms of both his verbal claims about his sleeping habits and his ability to sleep without awakening in the experimental situation. By awakening more often, both spontaneously and following stimulation, the unresponsive S provided himself with less opportunity to respond, because fewer cue word administrations were possible. example, a S's failure to experience hypnosis (or to sleep well) may have given rise to anxiety, disappointment, suspiciousness or poor rapport when he returned to sleep (or be hypnotized). It is worth noting, however, that even the 7 Ss who were only moderately susceptible to hypnosis slept as well as the deeply hypnotized Ss, both subgroups each accounting for 26 per cent on the total awakenings. The paradigm adopted for administering the suggestions during sleep was similar to that regularly used with passive motor suggestions. The sleep response was not, however, a simple manifestation of motor or primary suggestibility as the concept is usually applied to waking and hypnotic conditions (9, 10). Frequency of sleep response did not correlate with score clusters derived from the hypnosis scales measuring the various aspects of motor suggestion. Instead, sleep response frequency was related to the clusters typically consisting of phenomena obtained with somnambulistic hypnosis: hallucinations and posthypnotic effects. Although the correlation between sleepinduced response to suggestion and susceptibility to hypnosis was positive, it was statistically significant only when the carry over responses (responses during night 2 to suggestions administered during night 1) were considered. The relationship between response and susceptibility was most apparent when there was a dissociative temporal gap between the administration of the suggestion and the related cue eliciting the response, but was weaker when the eliciting cue and suggestion were in close temporal proximity. A common mechanism may exist in both situations, although it takes a different form. This speculative interpretation is supported by the significant correlation between the posthypnotic-dissociative cluster of items in the hypnosis scales and the frequency of carry over or dissociated responses. In the spirit of this kind of speculation, the correlation between the hallucinatory-reverie cluster of items and sleep response is possibly consistent with data indicating that, when a successful response occurs, the cue word may be incorporated into ongoing dream activity (12). Some kind of facility to control imagery and ideational content seems necessary to experience convincing hypnotic hallucinations and to manipulate ongoing dream content. It is noted that the hallucination-reverie hypnosis cluster was the only one which correlated with the sleep habits questionnaire score (r = .55; p < .05). It is also interesting that there are some Ss who experience posthypnotic amnesia, who respond during sleep in spite of intervening waking amnesia and who claim they do not recall dreams when they awaken. The assumed selective attention of the hypnotized S during trance and his ability to discriminate between relevant and irrelevant stimuli have often been stressed. If this is a general characteristic of the susceptible S, then he may maintain this advantage during some stages of sleep. He is able to attend selectively and process incoming information in such a way that allows a discrimination as to whether it is "necessary" to arouse and process the information at a more integrated waking level. Because of his lack of selective attention, the insusceptible S has to awaken to process incoming information. From this point of view, the relationship between susceptibility to hypnosis and sleep-induced response does not imply any similarity or interchangeability of trance and sleep states. Rather, the evidence seems to indicate that ability to have dissociative mental processes leading to a selective attention to external stimulation is common to both phenomena. 1. Barber, T. X. Comparison of suggestibility during "light sleep" and hypnosis. Science, 124:405, 1956.
plications a la Therapeutique. Doin, Paris, 1886. 3. Bertrand, A. J. F. Du Magnetisme Animal en France et des Jugements qu'en ant Portes les Societes Savantes. Bailliere, Paris, 1826. 4. Borlone, M., Dittborn, J. M. and Palestini, M. Correlaciones electroencefalograficas dentro de una definition operational de hipnosis sonambulica. Comunicacion preliminar. Acta Hipnol. Latinoamer., 1: 9-19,1960. 5. Chertok, L. and Kramarz, P. Hypnosis, sleep and electroencephalography. J. Nerv. Ment. Dis., 128: 227-238,1959. 6. Cobb, J. C., Evans, F. J., Gustafson, L. A., O'Connell, D. N., Orne, M. T. and Shor, R. E. Specific motor response during sleep to sleep-administered meaningful suggestion: An exploratory investigation. Percept. Motor Skills, 20: 629-636,1965. 7. Dittborn, J. M. and Armengol, V. Expectation as a factor of sleep suggestibility: II. J. Psychol., 49: 113-116,1960. 8. Dittborn, J. M. and O'Connell, D. N. Behavioral sleep, physiological sleep, and hypnotizability. Int. J. Clin. Exp. Hypn., 15: 181188,1967. 9. Evans, F. J. The Structure of Hypnosis: A Factor Analytic Investigation. Unpublished doctoral dissertation, University of Sydney, Australia, 1966. 10. Evans, F. J. Suggestibility in the normal waking state. Psychol. Bull., 67: 114-129, 1967. 11. Evans, F. J., Gustafson, L. A., O'Connell, D. N., Orne, M. T. and Shor, R. E. Response during sleep with intervening waking amnesia. Science, 152: 666-667, 1966. 12. Evans, F. J., Gustafson, L. A., O'Connell, D. N., Orne, M. T. and Shor, R. E. Verbally induced behavioral responses during sleep. J. Nerv. Ment. Dis. In press. 13. Fresacher, L. A way into the hypnotic state. Brit. J. Med. Hypn., 3: 12-13, 1951. 14. Gill, M. M. and Brenman, M. Hypnosis and Related States: Psychoanalytic Studies in Regression. International Universities Press, New York, 1959. 15. Gorton, B. E. The physiology of hypnosis: I. A review of the literature. Psychiat. Quart., 23: 317-343,1949. 16. Hammer, A. G., Evans, F. J. and Bartlett, M. Factors in hypnosis and suggestion. J. Abnorm. Soc. Psychol., 67: 15-23, 1963. 17. Hilgard, E. R. Hypnotic Susceptibility. Harcourt, Brace & World, New York, 1965. 18. Hoskovec, J. Hypnopedia in the Soviet Union: A critical review of recent major experiments. Int. J. Clin. Exp. Hypn., 14: 308-315, 1966. 19. Kleitman, N. Sleep and Wakefulness. University of Chicago Press, Chicago, 1963. 20. Monroe, L. J. Psychological and physiological differences between good and poor sleepers. J. Abnorm. Psychol., 72: 255-264, 1967. 21. Moss, C. S. The Hypnotic Investigation of Dreams. Wiley, New York, 1967. 22. O'Connell, D. N., Gustafson, L. A., Evans, F. J., Orne, M. T. and Shor, R. E. Can Waking and Stage I Sleep Always Be Told Apart by EEG Criteria Alone? Paper presented at the Association for the Psychophysiological Study of Sleep, Washington, D. C., March, 1965. 23. Orne, M. T. and O'Connell, D. N. Diagnostic ratings of hypnotizability. Int. J. Clin. Exp. Hypn., 15: 125-133, 1967. 24. Oswald, I. Sleeping and Waking. Elsevier, New York, 1962. 25. Schilder, P. F. and Kauders, O. [Rothenberg, S., trans.]. Hypnosis. [Nervous and Mental Disease Monograph Series, No. 46]. Nervous and Mental Disease Publishing Company, New York, 1927. 26. Shor, R. E. and Orne, E. C. The Harvard Group Scale of Hypnotic Susceptibility, Form A. Consulting Psychologists Press, Palo Alto, Calif., 1962. 27. Stoyva, J. M. Posthypnotically suggested dreams and the sleep cycle. Arch. Gen. Psychiat., 12: 287-294,1965. 28. Tart, C. T. The hypnotic dream : Methodological problems and a review of the literature. Psychol. Bull., 63: 87-99, 1965. 29. Weitzenhoffer, A. M. and Hilgard, E. R. The Stanford Hypnotic Susceptibility Scale, Form C. Consulting Psychologists Press, Palo Alto, Calif., 1962. The preceding paper is a reproduction of the following article (Evans, F. J., Gustafson, L. A., O'Connell, D. N., Orne, M. T., & Shor, R. E. Sleep-induced behavioral response: Relationship to susceptibility to hypnosis and laboratory sleep patterns. Journal of Nervous and Mental Disease, 1969, 148, 467-476.). ©1969 by The Williams & Wilkins Co. It is reproduced here with the kind permission of Lippincott Williams & Wilkins ©.